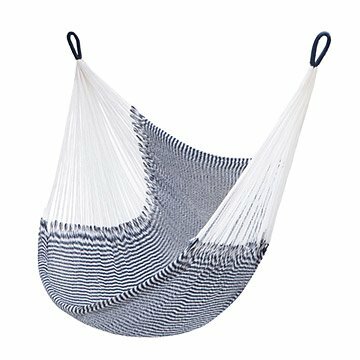 Lounge luxuriously with this hammock, hand-woven using traditional techniques by artists in Thailand. Doing good in the world has never been so comfortable. This ultra-cozy hammock chair helps to support the people who make it--members of a small village of the endangered Mlabri people in northern Thailand. The Mlabri were nearly wiped out in the mid 20th century, when the teak forests that were their home were cut down for decorative wood. But they have begun a slow resurgence by turning to their traditional weaving skills as a source of sustainable income for their community. This hanging hideaway is hand woven from two miles of soft, acrylic cord--an intensive process which takes three to four days to complete. It can be used as a lounge seat, with feet dangled out over the edge, or as a full-length, solo hammock, stretching out to seven feet. The hammock can support up to 300 pounds, and comes with its own, handy tote bag made from repurposed nylon. Handmade in Thailand. Click here to see hanging instructions..
Click here to see how your chair is making a difference..
7' L x 3.75' W; supports up to 330 lbs. Weather safe; If needed, Hand wash. in cold water with non-bleach detergent. Secure scale lines to prevent entanglement. Rinse thoroughly and hang to dry. Loved it! Ordered another one for my daughter. So comfortable I ordered one for my daughter. I love my hanging/hammock chair which my handyman hung from a tree branch in my backyard. It's very comfortable although at age 76, it's a bit of a struggle to get out of it. It will be great for our hot summer days as it's in the shade and the loose weave allows the air to circulate. It dries very quickly after rain. I'm not sure how to take care of it through our bitter cold MN winters as taking it down for storage will be quite difficult. Still pondering that. Soooooo comfy! Bring on the power nap!